Temporary yard where I-96 dirt was stored. 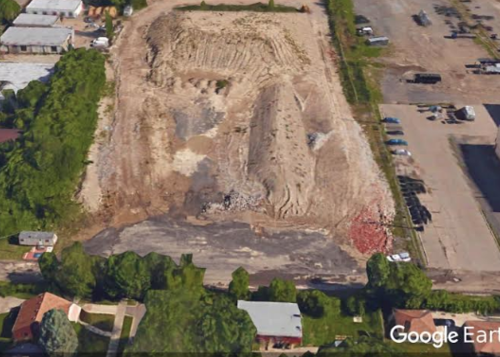 The Michigan Department of Environmental Quality tells the Detroit Free Press that federal investigators are indeed examining whether contaminated soil was used to fill demolition sites across Detroit. The confirmation comes after Charlie LeDuff reported in Deadline Detroit last month that the criminal probe into the city's demolition program had widened to include possible dirt contamination, according to subpoenas sent by the Special Inspector General for the Troubled Asset Relief Program (SIGTARP) to at least nine contractors. MDEQ tells the Freep the soil in question contains road salt and may have come from an I-96 construction job. The Duggan administration declined to use that dirt, which was available for free, early on in its demolition program, citing the contamination. It allowed contractors to instead obtain their own dirt. SIGTARP is reportedly looking into whether the contractors tapped into that pile anyway and billed the Land Bank for it. Though MDEQ acknowledged that "the chloride concentrations in the soil did exceed the residential soil criteria," it said there was no public health risk because Detroit is served by city water, as opposed to well. "I would still be concerned about chloride washing off of sites during rain events and snow melt and getting into storm drains and making its way into surface waters, or that it would be captured by the combined sewer system and have to be treated at the wastewater treatment plant," [Nick] Schroeck said. "In the event of a water main break or other loss of pressure to the municipal water supply, ground water can seep into the drinking water distribution system. If the groundwater surrounding the drinking water pipes is contaminated, it can lead to potential contamination of drinking water."